Not knowing this was about a giallo going in to it and then getting the fake title sequence was like opening the world's greatest Christmas present. Nifty little film that immediately shows its love (as well as attention to detail) for both film sound design from the '70s and Giallo films, without exactly replicating this era. It's quite the love letter and boosted by some fun characters with the way they handle post-sound, though the film isn't sure where to continue on with this and fizzles towards its ending. Would've made a better 20-30 minute film, for sure. There are few films in which style and subject matter are so interwoven than in this movie. It uses the style and most of all the sound effects of horror to create an eerie atmosphere. It's the kind of movie one has to just go with the flow, because when you start overthinking this one realize their isn't anybody in real danger. In doing so Strickland shows how much of the viewers expectations is dependent on style and music and not on plot. This enjoyably uncatering tribute to slocky Italian cinema in which style becomes the content comes threateningly close to grinding to a halt. But said style kept me more or less engaged throughout. I'm hoping that Strickland will make a genre film of his own one day. Loved all the sound design details but the eventual turn to a smorgasbord of New Wave techniques didn't seem well linked to the plot at all. I'm not the biggest Mulholland Drive fan, but I couldn't help thinking of the Lynch film and how frequently it does the same things better. Boring. There is no horror in there. Well. It was really cool in how it was made, I loved the sound, the music and the style of the cinematography - excellent use of colour, and I utterly loved the use of light and shadow. The plot... Well, it kind of seems non-existent, and in the third act it's pretty plain it died right off. Horror movie as a cocoon of simulacra. Skeptically critical of the ideology of authorship (or auteurism) in many of the same ways as Black Swan, but whereas that film culminated with the (literal?) disfiguration and destruction of its protagonist in pursuit of someone else's vision, this film posits a different path: complicity, diminishing notions of selfhood, and -- eventually -- (literal?) absorption into the project itself. Love AFlickering's description of "giallo meets The Conversation." Charming, unnerving and all-in-all quite sublime love letter (or hate mail depending on your views) to sleezy 70s Giallo production. The standout, not surprisingly is its brilliant implementation of sound design both in the narrative and in creating the unsettling atmosphere. Plot-wise it most definitely goes off the rails in the end and leaves you there, but, I'll allow it. I like it more on paper. 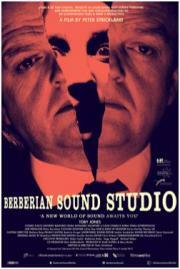 Peter Strickland is definitely a director to watch, though.